Click Here for the Homes for All Department of Human Services Appropriations Requests One Pager. Click Here for the Homes for All Minnesota Housing Finance Agency Appropriations and Policy Requests One Pager. Click Here for the Homes for All Bonding One Pager. Click Here for the Homes for All Taxes One Pager. Housing instability threatens individuals, families, and students. More than 1 in 4 households in Minnesota are housing cost-burdened, an increase of more than 70% since 2000. 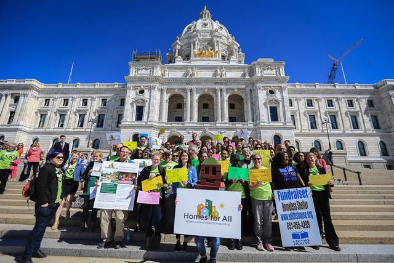 More than half of Minnesotans experiencing homelessness are children and youth, with nearly 9,500 public school students identified as homeless or highly mobile during the 2015-16 school year. Minnesota will thrive when everyone has a place to call home. Our legislative proposal strengthens Minnesota’s Housing Continuum, in every corner of the state. The dollar amounts are flexible in order to adapt to budget forecasts and lawmaker priorities. Family Homeless Prevention and Assistance Program (FHPAP) - $4M biennium base increase: Rental Assistance funding to serve adults, youth and children at risk of experiencing homelessness.